As we drove into Medicine Lodge, we noticed a change in the scenery that most people would tie to being in the state of Oklahoma or a particular type of country music-red dirt. Heading west out of town on the bike, I began to wonder if we were still in Kansas or had somehow transported to another state in the Southwest. Feeling as though we were in a time long gone by, we rode along Hwy 160 through a landscape reminiscent of a western movie set. Oil derricks, deserted farmsteads, cattle guards and 5-strand barbed wire fences dotted the landscape. The road was straight, but desolate with only a handful of populated homes apparent along the 42-mile ride. If you want to clear your head and get away from the hustle of life in a more populated area, this is the ride for you. Your company on the ride will be cattle in the pastures, roadrunners and maybe a snake or two when the weather gets warmer. Be sure to watch out for the tumbleweeds. We quickly found out they get stuck on your boot pretty easily! There are two scenic overlooks within five miles of Medicine Lodge. Both are definitely worth stopping to get the full effect of this rugged countryside. When you&apos;re ready for a little company that doesn&apos;t involve wildlife, you&apos;ll find a good stopping point at Coldwater. A town where the choice of headgear appeared to be more cowboy hats than do-rags, we found a warm welcome on a chilly spring day at Dave&apos;s Pizza Oven. The hospitality was great to two wind-beaten, leather clad guests, and the food was outstanding. Dave, the owner, delivered our pizza to the table with a smile, after preparing it himself in the open kitchen. A cruise through town took us down a wide main street with brick buildings on each side. On the south end of the downtown area, there was a veteran&apos;s memorial park with a long list of names of those that have served in our country&apos;s history. Comanche County may only have 1800 people living there, but they have proudly supported our military efforts over the years. 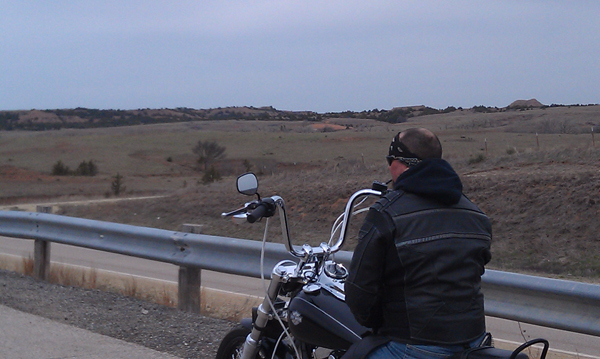 It was a quick ride from Medicine Lodge to Coldwater, and a long haul to get the bike down there from home. However, it was worth every minute of drive time to get there and see the wildness of the Gypsum Hills countryside. Note: If you&apos;re looking for more highway time in the Gypsum Hills, multiple people recommended taking the road to Sun City and a stop at Buster&apos;s Saloon for a cold beverage and good food. With a scenic winding road, it&apos;s a bonus to the scenic Byway ride.